We were looking for the perfect food for a football pre-party. We love chicken wings with hot sauce and blue cheese dip – but hate deep frying at home. 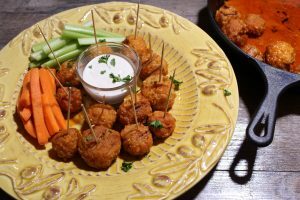 This fun tailgate treat is easier to munch than traditional buffalo wings. Plus you get all the zesty spice and the joy of biting into the blue cheese center with every bite. No bones about it. They’re good! Mix together chicken, Bisquick, bouillon, water and cheddar cheese. Form chicken mixture around 1 cube of Bleu cheese, and roll into a ball. Grill on medium heat for approximately 30 minutes until firm and internal temperature reaches 160°F. Using a cast iron pan on indirect heat, melt butter and stir in Frank’s Red Hot Sauce and Cayenne pepper to mix. Dredge cooked chicken balls in hot sauce and sprinkle with parsley before serving. Serving suggestion: serve with cut celery and carrot sticks and Ranch dressing for dipping.